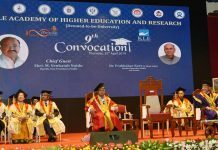 Chandigarh: The Union Minister of Health and Family Welfare, Shri J P Nadda said that Government is fully committed to ensure proper delivery of health care facilities to the poor, needy and underprivileged sections of the society in every nook and corner of the country. 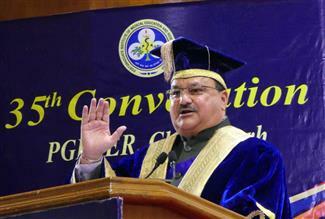 Delivering his convocation address at the 35th Convocation of Postgraduate Institute of Medical Education and Research (PGIMER), Chandigarh today, Shri JP Nadda said that Government is coming up with AIIMS like institutions in various parts of the country and expanding the network of the medical colleges in a big way by upgrading district hospitals to medical colleges. Government schemes like Ayushman Bharat will bring a complete change in delivering health care facilities to everyone.